Beside the classical courses held within national, European and international projects, the certifications courses can be organized as in-house courses, e.g. for groups of 10 to 30 attendees. Credit points (ECTS – European Credit Transfer System) earned through the certification program title can be transferred towards the respective Master Program. In the first part the course covers an International Standard of ISO 31000:2009 elaborating the relationship between the risk management principles, framework and process as described in this International Standard. The course also highlights issues related to the applicability of the standard in industry and in general. The second part of the course deals with the issues related to practical implementation of ISO/IEC 31010 standard 31010:2009 (codified by The International Organization for Standardization and The International Electrotechnical Commission (IEC)). The standard itself intends to provide support for implementation of the main, ISO 31000 standard, giving principles of risk assessment and the risk management process. 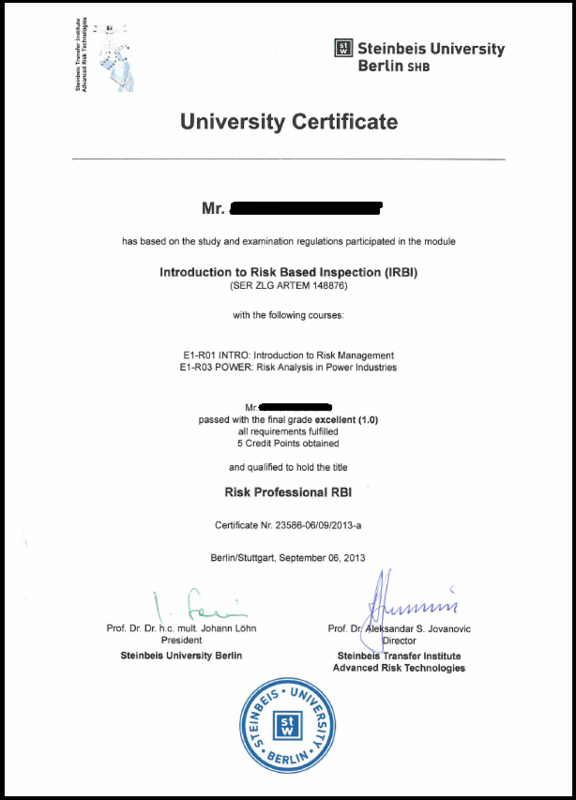 The course has been organized within Risk Radar China Project. This course provides a lecture on indicator-based resilience assessment with focus on the developments in the SmartResilience project. The course describes step-by-step how to perform resilience assessments in a transparent and structured manner for one or more critical infrastructures within an area, e.g. a city. The most relevant threats, such as terrorist attacks and cyber-attacks, are assessed for each critical infrastructure focusing on the "issues" (factors, capacities, capabilities, etc.) that are most important to ensure resilience in each phase of the resilience cycle from understanding risk to adapt and learn. The issues are measured by resilience indicators, and any type or form of indicators are considered appropriate, meaning that it can be yes/no questions, numbers, percentages, portions, or some other type. Proposals for issues and indicators, i.e. "candidate" issues and indicators have been collected throughout the SmartResilience project and stored in a database. Suitable sets of indicators for selected critical infrastructures and relevant threats are generated as "dynamic checklists" from the database. This and other supporting tools will be explained in the course. One key reference method forming the basis for the SmartResilience methodology (in addition to the REWI method) is the method developed by ANL and extensively used in the US. The ANL method will be presented by one of its core developers.The course has been organized within SmartResilience Project. As we tailor our training offer to the needs of our customers, we can’t display a standard price for each certification track. Depending on the amount of participant, the course location and the lecturer(s) involved we will propose you training plan that fits your requirements and draw up a quote at the best possible price. So if you are looking for a European recognized certification opportunity, whether for yourself or for your company, please do not hesitate to contact us directly. Our team will translate your requirements into a tailored training plan.